Discussion in 'Modding' started by woof82, 15 Jul 2007.
dacust, sounds like you know what you're talking about I was considering using wheels, but this is just a small trebuchet, so I think that they wouldn't make much difference and could cost quite a bit to add. I was considering using wheels, but this is just a small trebuchet, so I think that they wouldn't make much difference and could cost quite a bit to add. Just suspend the weight. That actually works better than wheels. And you can do it cheap. Im starting building mine on Friday when School breaks up. Then its only about 40 mins to Oxford from Winchester, do you think they'll let me on the park and ride with a Trebuchet? Hah, possibly not, I kind of meant post pictures and measure launch distance and weight of projectile etc. @dacust: somebody did his homework and has developed quite an intimate relationship with trebuchets. LOL jk. Hey, I know I'm strange. And I'm OK with that. I've always liked old weaponry. A Christmas or two ago my brother gave me a book on catapults (a trebuchet is just an advanced catapult design). It actually taught me very little I didn't already know about the designs and workings, but I learned a lot about the history. I can't find the book right now, so I can't quote, but here is something it said (imperfect from memory). Last successful us of a trabuchet - 17?? - and it goes on to describe the encounter. Last unsuccessful use of a trebuchet - 18?? - and it goes on to describe how in Mexico during a siege, a soldier convinced the commander that he could build a trebuchet to batter down the town walls. He built it. The first shot went straight up in the air, came down and destroyed the machine. The commander refused permission for building a second one. Remember, for silly, useless, arcane information, ask dacust. If you want information on a particular subject, I may not know anything, (after all, if you ask for it, it may be useful, duh!) but I guarantee you I can find an inventive way to go off on a tangent and tell you something silly and useless on a totally different subject. So now you see I can just staple some string onto the firing arm, then tie a loop the end of that string and hook it onto that peice of metal near the ground as it sits resting between the two eyelets, and when I want to fire, I just tug on the rope attached to that peice of metal. I didn't get a picture of it all together but I think you get the idea. Ok next up is another trickey bit - making the sling for the projectile. Oh, yeah. It's coming together. I'm thinking you may get good performance out of that without too much tinkering. I LOVE seeing someone do a good job cheap. Just out of curiosity, what are you doing to ensure no one gets killed firing your weapon? I'd predict that the wood components in particular will fail catastrophically after a few cycles of tension and release. Also, a broken cable under high tension could easily decapitate someone, or tear open an artery- bleeding to death in 30 seconds is not the way most people plan on ending their lives. In another life, I used to construct things like this all the time, and catastrophic failures were not unknown. After a while, I avoided using materials that splintered or tore on failure. Umm... maybe you didn't look at that picture, but the wire is only 4 inches long, and the barbells only weight 10lbs... You would actually have to lie underneath it and hope they slid off and hit you in the face to even receive significant injury. I'm going to say beyond all reasonable doubt that death is not a concern with this device. Wow! 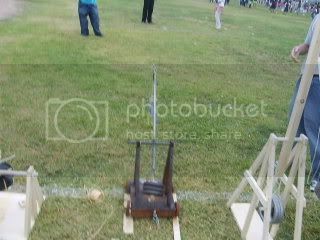 thats pretty awesome, i remember i built a mini (really mini, like.. 2 foot tall) trebuchet for my physics class a while back, it was pretty cool, but not half as good as yours. Good luck on your project! nice random build, i love it. keep us updated. Oh, and if there aren't pictures of your cat flying thru the air then i will be severely disappointed. As will I. He shouldn't mind. I mean, at least you're shooting him out of a mini trebuchet. The first time I fired this (after adjusting the pouch...) it hit the roof of the garage. The second time I fired... it hit almost exactly the same spot - I was impressed with the consistancy! The third time I fired it cleared straight over the garage into our neighbour's garden! Success!!! Cool! I second the video request! Have you seen the weather outisde?